I have a few rules for my mom style. Mostly these are practical and were developed from trial and error from having a baby/toddler. Comfortable: I pick clothing that cannot easily be pulled on and then be revealing...if you know what I mean (haha). Also, they need to allow me to move and chase a toddler. Honestly, I tend to do jeans with a cute top these days. Less fashionable, more practical than my pre-baby days. Fit: Does it fit your body type? Don't dress for who you wish you were - accept and love yourself and find things that fit you right now. For instance, I'm not really a curvy gal, so I need to find things that fit my straight body. Baggy, bohemian things don't really work for me; I just look lost in a jungle of fabric. Even though I can be insecure about it sometimes, closer fitting things work better. Find the styles that work best for you and focus on those items. Love: You gotta love the clothing items you buy. Don't just be iffy on it, love it. Whenever I buy iffy, I end up not wearing it. Then it's not worth the money and you're disappointed. If you go home and still don't love it, return it. Jewelry: I avoid necklaces when I'm with my child. He yanks and pulls on them. Unless it's a cool teething necklace. The same thing goes with long earrings. Just ouch. I do wear studs, or sometimes a very short dangly earring. Generally, my jewelry makes rare appearances on date nights or special occasions. I'm all about asking people for help and getting recommendations. At restaurants, I often ask the waiter their favorite dish. Or, I check out a review of a place before going. Overall, seeking help or getting recommendations has really paid off. I promise. So it goes without saying, that I often try to get help from the salespeople at the store. In many places I like to shop, the salespeople are usually very eager to help. My two favorite stores to ask for help are Nordstrom and Evereve. They always seem to make an effort to see what you like and go in search of things they think you'll enjoy. One advantage to having them help you is that they know where most everything is in the store, even those cute tops hidden on the rack on the wall in the corner. Most likely a place you'd never find. Or, they'll suggest something that you would never have taken off the rack, but then try on for the "heck of it" and end up loving. Also, some of my favorite shopping experiences have been with a Nordstrom Stylist. It's free, fun, and no obligations. Fun Fact: Do you know how I landed with my wedding dress? The sales gal brought the dress out, I said "ehh" but tried it on anyway. And BOOM, love! Don't poo-poo something before trying it. Since I'm a mom now, buying online seems to be the most convenient way to shop. Clothes shopping with a toddler is a real struggle. I feel like I'm more just chasing Caleb than shopping...and he's a runner. So it's more of a workout than a shopping experience. So, I go online. I roam the different store's sites in search of cute things, but before I buy, I read the reviews and check the stars. I generally don't go with something if it's lower than 4 stars (out of five). If there are no stars or reviews, I might just skip it all together. A good idea is using the filter function on the website to filter by reviews, too. Maybe I listen to others too much, but in this area, I do think it's helpful. Do you remember my earlier post on Stitch Fix? That's a subscription box. It's an online service where you fill out a profile, a stylist finds you some items, they ship it, you try it all on, then keep what you like and return what you didn't like. If you're worried about commitment, don't be; not all of the subscription boxes require you to commit to an actual ongoing subscription. In fact, most allow for a one-time box or chose your box timing. They can be a great way to get clothing or accessories you might not have found or picked out yourself. Oh, and the best thing about these boxes is that you don't have to leave your house. You get a curated box just for you delivered to your doorstep. Being a mom getting to the stores is hard, and shopping with a toddler is even harder. So this delivery option can be just the ticket. I am a blog-aholic. Sure, I write a blog but enjoy following blogs even more. I follow mostly food blogs as that's where I get my dinner and sweet treat ideas, but I added a couple of fashion and style blogs to my list as well. 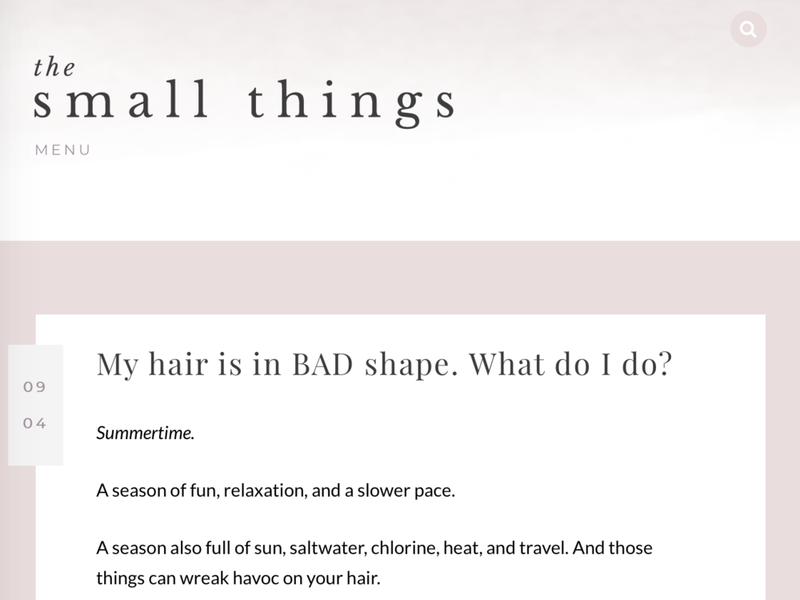 Right now, I am following The Mother Chic and The Small Things blogs. The Mother Chic is more about clothes and is sure to tell you about all the sales and The Small Things blog is more about make-up, skin care, and hair. If you're not a blog person, then you can like some of these trendy folks on FaceBook as well. I "liked" the One Little Momma page and see her posts in my Facebook feed. This is similar to my "ask the professionals" tip. I'm all about getting help from others that are more adept in a particular area. If you're a mom, leave your kids at home with dad (or someone you trust). Shopping and kids just doesn't mix. Been there done that, and yea... it's usually a flop. And that's what I do. What are some of your tips and tricks?